Pakistan is trying to combat terrorist organizations online, with mixed results. 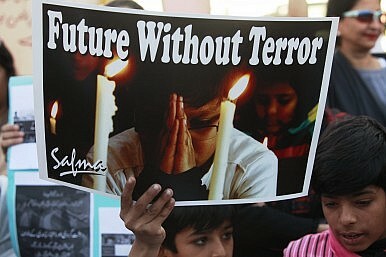 Following the devastating attack on Peshawar’s Army Public School on December 16, 2014, where the Pakistan Taliban killed more than 130 children, military and political leaders formed a National Action Plan to counter terrorism. One point in the 20-point plan called for the formation of a committee to counter online terrorism, in a country estimated to have nearly 30 million Internet users. The Pakistan Telecommunication Authority (PTA) has been taking action against pages on social media and online videos posted by terrorist groups. There are approximately 60 banned organizations in Pakistan, according to the National Internal Security Policy (NISP) document. Recently the federal government has been reluctant to confirm a reported ban on Jamat-ud-Dawa (JuD), but news reports say that the ban is part of the National Action Plan. The Twitter account of JUD chief Hafiz Saeed was suspended two months ago but the organization’s website can still be accessed and Twitter accounts with his name still exist. According to Ahmed Rashid, author of several books on Pakistan and Afghanistan and veteran policy critic, questions the priorities. “Social media is a very big part of recruitment in the West. In Pakistan it helps produce a point of view amongst those on Twitter and other such sites but doesn’t have the power to recruit.” Rashid says that access to social media is limited in Pakistan, as opposed to more developed societies in Europe where there are huge online followings. Yet addressing the mosque is but a fraction of the overall picture. There are a total of 22,052 seminaries in Pakistan, 15,954 in Punjab, 4,264 in Sindh, 1,400 in Khyber Pakhtunkhwa (KP), 1,247 in Balochistan and 187 in Islamabad. The government’s campaign to register seminaries in the country and obtain data on their financial resources, teachers and students has met with strong resistance. In many seminaries, which are always affiliated with a mosque, a modern education is replaced with a questionable interpretation of religion that influences young minds. These seminaries then become fertile ground for terrorist recruitment. Aziz believes that the Pakistani government should be focused on disseminating a cogent counter narrative. It needs to come up with its own websites that explain a peaceful version of religion to provide a “soft” alternative to extremist views. However, experts say that an online government policy will be severely crippled without corresponding or supporting action in the offline world. Many mosques deliver inflammatory preaching and propagate extreme views, clerics breed sectarianism and fatwas are often issued against minority Shia. Part of the government’s strategy in countering terrorism is to take steps that show tangible progress. That means monitoring – if not completely ending – public sermons that spread hate and eventually find their way on social media in the form of brazen video messages and clips.